You know there’s a connection between your life, your health, and your happiness. You don’t need convincing; you just need a starting place. For 5,000 years, the mind-body science of Ayurveda has taught how diet, exercise, herbs, stress, relationships, thought patterns, sleep, and spiritual practices affect our lives and our health. Health is not merely the absence of disease. Health is defined in Ayurveda as the balanced state of doshas (bioenergetics), digestion, tissues/cells and elimination, along with a balanced state of mind, senses, purpose and connection. Because the mind is in every cell, we cannot simply treat the physical body without addressing the experience of living within it. Because you are more than a collection of lab tests, meal plans, and wardrobe changes. JOIN A SMALL ONLINE GROUP TO DIVE DEEPER INTO THE FOUNDATIONS OF AYURVEDA, INCLUDING CONSTITUTION, DIGESTION, ESTABLISHING A DAILY PRACTICE, HOME REMEDIES, AND WORKING WITH THE MIND. IF YOU’RE WORKING WITH A SPECIFIC HEALTH CONCERN AND WANT PERSONALIZED RECOMMENDATIONS-INCLUDING DIET AND HERBS- THIS IS THE PLACE TO START. YOU CAN ALSO START WITH DIY OR GROUPS AND FOLLOW-UP WITH PRIVATE CONSULTATIONS. I understand living with an invisible chronic illness, and putting self-care last on the list. As a teenager, I had severe Rheumatoid Arthritis. I had all kinds of support and braces on the outside of my body and drugs on the inside, and at the age of nineteen I walked with a cane. The RA was severe for ten years, despite conventional western medical treatment. In my mid-twenties, I went rogue. I knew I could be healthier, and I knew I needed to adopt a new way for being in the world. I chose a path away from the medicine I grew up with and started meditating, studying movement therapy, thinking, reading, wondering. I lived with pain for fifteen years. And now I don’t. I spent a lot of years trying different methods and practices, I spent time sitting at the bedside in hospice, apprenticed with Darlene Cohen, a Zen priest who focused on working with pain, and eventually went back to graduate school to receive a Masters in Holistic Health Education. A few years after completing my degree, I began specific study in a five-year program in Classical Ayurveda Clinical Medicine at Vedika Global College of Ayurveda in Emeryville, CA where I became adjunct faculty. 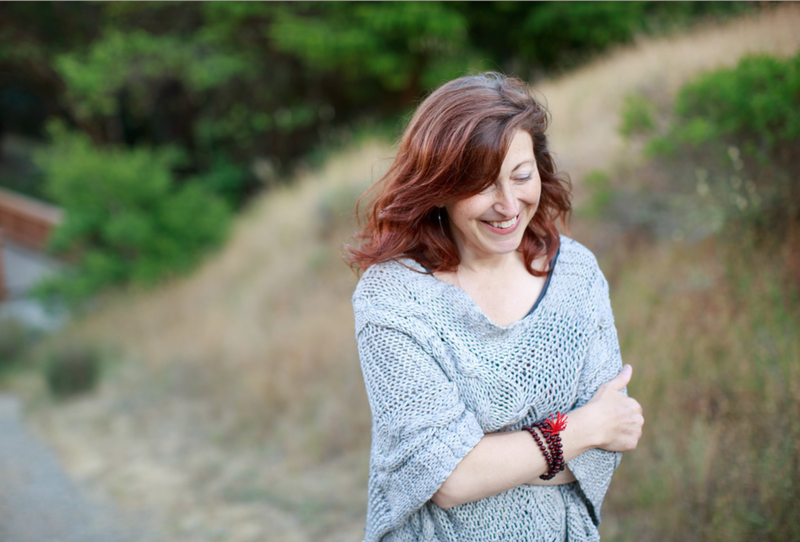 After working in Integrative Medicine alongside Functional Medicine doctors, I currently serve clients online and in-person in the San Francisco Bay Area. It would have been a far more direct path to health, had I learned about Ayurveda sooner. Ayurveda is my medical toolbox, my kaleidoscope for seeing the world, my map for understanding myself and finding the way back to being healthy. Ayurveda, Yoga Philosophy, and Vedanta taught me about my connection with myself and the world: what makes me well, what makes me sick. And once I understood that, the fun happened: I began to re-establish the natural rhythms of my body and mind, recover my voice, my faith, and my health. I learned to consciously use my environment, my senses, the spices in my kitchen, my movement routines to support my being fully, healthily, wholly me.